With over 30 years of experience in pest control, Paul Chapman and the Pestproof Pest Control team can offer you a one-call solution to eradicate all pests. 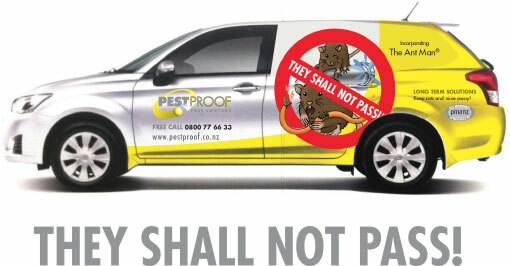 Pestproof Pest Control is a New Zealand owned and Wellington-based company. With over 30 years experience in the pest control industry, and a unique approach to every situation, we have steadily established our brilliant reputation through customer satisfaction and goodwill. We focus our work on solving the pest issue at its source, and at the same time minimising the use of chemicals as much as possible. If we come across a situation where we can relocate a normally beneficial pest (eg. honey bees or bumble bees), we will either personally relocate the hive or offer help from relocation specialists. Our technicians are trained to spot proofing recommendations during every job, and at the end explain to the client what these are. We are now widely employed by both residential and commercial customers, and our client base continues to grow. Despite having only a small team to manage the work load, we consistently deliver the personal touch and develop strong relationships from the face to face interaction we have with all of our customers. We are also the ANTMAN as well as Pestproof. This will open doors to many opportunities in the future, as we continue to be the ant specialists in the wider Wellington region. We have built a very reliable and trustworthy reputation, and treat our customers and their property with the utmost respect. We are eager to protect the integrity of our technicians and our companies’ reputation, thus offering a very high level of professionalism and effective results. And most importantly of all we are here to achieve results for you.